Netflix’s Jessica Jones premiered today with 13 new episodes centered around Marvel’s private investigator with super powers. It’s incredibly fitting that a show which humanizes a female superhero debut on the day devoted to celebrating real life female superheros. 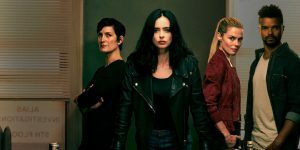 Jessica Jones, a collaboration between Marvel Entertainment, ABC Studios, and distributed on Netflix, hasn’t graced our streaming devices for quite some time. The original 13 episodes debuted more than two years ago in November 2015, which seems like an eternity now that we’ve gotten new Marvel TV shows. Some have been fair, but none have been quite like Jones. In 2015, Jones debuted to stellar reviews from both fans of the Marvel Cinematic Universe and Critics alike. The introduction of MCU favorite Luke Cage didn’t hurt, either. What was so fresh and compelling about the show, executive produced by Melissa Rosenberg (Dexter, Twilight) was the neo-noir directorial style and unforgettable performance by Krysten Ritter. The first 13 episodes centered around Jessica learning to control her powers and tracking down a tormentor from her past: the infamous Kilgrave. Where he could control minds, Jones learned she could control everything else with her (very powerful) fist and super strength. Her iconic one-liners were also a treat. In Season 2, Jessica has returned to solve crime, all while trying to keep her small business as a private investigator from going under. In Episode 1 – “AKA Start of the Beginning”, Jones is confronted with her past in new and propulsive ways. And, I’m happy to report that the neo-noir style is still very much in tact, which at this point is integral to the genius of Jones. Rytter continues to be a star, supported by a great cast including Carrie-Ann Moss (Memento, Matrix) and Rachael Taylor (Charlie’s Angels). But the powerful female forces don’t stop in front of the camera. Notably this season, every episode is directed by a women. To say this is “rare” in the TV world would be an understatement. “AKA Start of the Beginning” is directed by Anna Foerest, known for directing features (Underworld) and television (Dexter, Criminal Minds). And that’s just the beginning of female filmmaker starpower to come for the remaining 12 episodes. Thankfully on this International Women’s Day, Jones is committed to championing superheroes in front of and behind the camera. Jessica Jones Season 2 is currently available on Netflix. Praise Be! Teaser Art and Trailer For 'Handmaid's' Season 2!